Eternal Legend (Revision) The Final First Stage!! Eternal Legend (Kaiteiban) The Final First Stage!! Galaxia has been revived and is fighting Tuxedo Mask. He puts up a fight but eventually is struck down by Galaxia and has his Star Seed stolen. Elsewhere, in what looks like a church in the past, Hotaru (or a previous incarnation) is being attacked. Luckily four saviours appear and fight off the three villains. After the fight, the director walks on and yells "CUT!" The whole fight was part of a tv show! Turns out the director is using students from Usagi's school as actors. Hotaru, Usagi, Minako, Makoto and Ami are really excited. Rei arrives and is furious as she goes to a different school and wasn't given the chance. Usagi teases her about it but Rei soon works her charm and is offered a role on another show which makes her very happy. The Sponsor (Banzai) appears and tells the director that their "Prince" for the next scene hasn't arrived. He convinces the director to do the part and as he removes his wig and jacket surprises Usagi, and everyone with his resemblance to Mamoru. Usagi and the director perform the scene of them both dying yet unable to hold each other's hands. The Sponsor talks to himself how this will soon become reality. Elsewhere, Sailor Galaxia decides to revive and old evil to help her take over Earth, Queen Beryl! Queen Beryl is pleased to be released and surprised by Mamoru who arrives in Prince Endymion form and swears loyalty to her. The Sponsor tells her that he is her ally now and hearing this she stands beside him and contemplates how to destroy Sailor Moon once and for all. At Usagi's school, Usagi, Makoto, Minako, Haruka and Michiru are playing basketball with some other students with Hotaru and Chibi Chibi looking on. The school principal, Kyoto (who is obviously the same person as the "Sponsor") runs up to them though and tells them all to go home as students have been attacked recently. He then introduces them to the new teacher who, like the director, looks just like Mamoru! As they leave, Ami walks arrives and begins to ponder her dreams of studying abroad (again). The new teacher and Kyoto talk to Ami and tell her that they'll help her fulfil her dream! Ami, excited, tells all the others straight away. Before they can react though a woman screams and a mysterious temple priestess runs away. Unfortunately, Rei appears in her priestess clothes straight after and the two teachers accuse her of being the culprit. Rei runs away and everyone else begins to look for clues. Haruka and Michiru run into The Starlights while looking for clues and leave them straight away as they comment on their scene being "filler". The Starlights do several Japanese word games for a few minutes (hilariously) and then leave. In the next scene the two teachers and the imposter reveal their true intentions and begin to gloat about framing a Sailor Soldier. Sailor Mars then appears though and says that she's been tracking them the whole time. She starts to attack them but is knocked out by a dark power attack from two underlings. Everyone arrives and before Sailor Mars can regain conciousness the two teachers drag her away. Seiya says to Usagi that the time will come when all of her friends will turn on her and that she must be strong. In Galaxia's new golden castle, Galaxia boasts how everything is going according to plan and that she's simply using Queen Beryl to awaken Hotaru (who can't transform yet in this story) so she can take her Star Seed. Elsewhere The Starlights are singing for their princess to find them but after days of trying they're about to give up. Seiya goes to Usagi's house to see how she is as she looked lonely before. Usagi misses Mamoru a lot and imagines him singing with her. Seiya then arrives and they both sing about waiting for the person they love to return. Somewhere else in Azabu Juban, Yaten and Taiki run into Rei who has escaped. She tells them that the teacher, Kyoto is an imposter. As he arrives, chasing her they capture him. Sailor Neptune and Uranus also arrive. Rei beats the crap out of him for framing her. They take the imposter to Usagi and let him go. As he rejoins Endymion and the two begin to talk about how they will turn Sailor Mercury on her way abroad all the Sailor Soldiers come out of hiding and explain that they let the imposter go so they could find out who he was working with. Eternal Sailor Moon then joins everyone and is shocked to see Endymion. Queen Beryl then makes her entrance and zaps everyone repeatedly. The Sailor Starlights run up to them and try to protect them all. Sailor Saturn then arrives, awoken by the conflict with Sailor Pluto and blocks the blast with Silent Wall. Galaxia then arrives and says that she's disappointed in Beryl. Star Healer and Star Maker attack her but their attacks are no good. A bright light then signifies the arrival of Princess Kakyu. Princess Kakyu is pleased to finally be with The Starlights and honoured to be in Usagi's presence as she is the holder of the Imperial Silver Crystal. Chibi Chibi says that there's hope which causes Usagi to finally ask Chibi Chibi what she is. Before she can answer, Galaxia addresses the entire world and says that if people want Earth to be saved they must sacrifice Princess Kakyu. Beryl then also addresses the planet and tells Sailor Moon to meet her alone if she wants Endymion back. Sailor Mercury talks to the other girls in private though and they all plan, along with Haruka and Michiru to go and fight Galaxia as well. As Super Sailor Moon gets close to Galaxy TV Studios, the teacher / sponsor meets her and says that he wants to help. He tells her that the Endymion she will face is a fake and that Galaxia has one weakness, the light of hope. Super Sailor Moon is then transported to Galaxia's base where she is immediately struck down by Beryl who proceeds to explain that in their past lives Endymion was her fiance and that she stole him from her! She also explains that for a person of the Moon and person of the Earth to marry was forbidden and it was her fault that war broke out. Endymion then appears with Galaxia and Super Sailor Moon tells Beryl that this Endymion is a fake. Galaxia confirms this and says that the real one is long dead. Both Beryl and Super Sailor Moon are shocked. Galaxia tries to kill Super Sailor Moon but Princess Kakyu dives in front of her and takes the blast, dying in the process. The Starlights run to her and watch as their princess dies in their arms. Sailor Mercury, Mars, Venus, Jupiter, Uranus and Neptune then arrive and begin to fight but Galaxia quickly kills Mercury, Mars, Jupiter and Venus without a second thought. Sailor Mercury looks up at Super Sailor Moon, still alive but is zapped once more and disappears like the others. Sailor Uranus and Neptune then begin to fight Galaxia but are interrupted by Beryl who demands to know if she is indeed being used by her. Galaxia tells her she is which causes Beryl to attack her. Galaxia then summons her minions to battle her but they're easily fought off by Beryl and then destroyed by Galaxia who now sees them as too weak. Sailor Saturn and Pluto then arrive to save Beryl. When asked why, Pluto tells Beryl that she can relate to the feelings of loving someone who doesn't return your love. Sailor Saturn then sends Beryl to safety at the end of time. As Pluto and Saturn walk over to Neptune and Uranus, they're horrified to find that they've decided to join Galaxia. They both accept her bracelets and bow at her side. Sailor Neptune and Uranus then move to attack Pluto and Saturn. Galaxia summons Super Sailor Moon and The Starlights to her location so they can watch the battle. 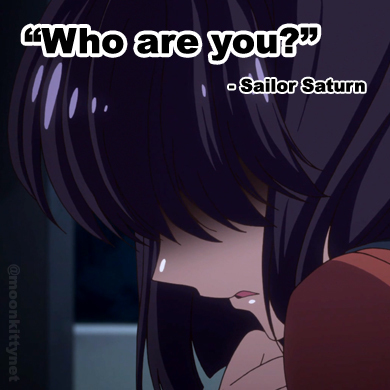 Sailor Pluto and Saturn are both easily killed and disappear. Sailor Neptune and Uranus then turn on Galaxia and try to steal her Star Seed but are shocked to see that she has none! Galaxia then kills them both. The Starlights are furious as no there is noone to protect Sailor Moon. Queen Beryl then returns and tells Galaxia that she is finished. When asked how she returned, Beryl says that now that there is no guardian of time, it was easy to return here. Queen Beryl tells Galaxia the value of love that she has learned and asks her to save the universe. Galaxia then summons Endymion and leaves. Queen Beryl tells Super Sailor Moon to fight but she doesn't and is strangled by him. Endymion goes to stab Super Sailor Moon but Beryl steps in the way to protect her and is stabbed. As she dies she says that she is happy to die for passion this time. Super Sailor Moon then runs up to Endymion and gives her all her power by kissing him. Endymion begins to die but just before he does, his voice tells Sailor Moon not to fail. Super Sailor Moon begins to cry for everyone that has died but is stopped by the arrival of Sailor Mercury who was saved by the teacher / sponsor! Sailor Chibi Chibi then arrives and tells everyone that they must go with her to the Galaxy Cauldron where Star Seeds are born. They all then teleport away. In the darkness, Sailor Chibi Chibi tells the story of the great evil, Chaos who was destroying every world in the universe. She, the strongest Sailor Soldier seeing no other way took Chaos into her body but as he started to take her over she expelled her Star Seed so it would be safe. Chibi Chibi is that Star Seed! Super Sailor Moon then arrives at the Galaxy Cauldron with Sailor Mercury and the Starlights and finds Galaxia in a more evil dark form. Sailor Chibi Chibi then appears. Sailor Starfighter calls her the Light of Hope. Sailor Chibi Chibi tells Super Sailor Moon that all the villains she had fought up to this point were her siblings as everyone comes from the Cauldron originally. She then tells Super Sailor Moon that now is the time. Super Sailor Moon then powers up into Eternal Sailor Moon and sends Sailor Chibi Chibi into Galaxia and gathers a sword to fight her with. Eternal Sailor Moon then blasts Sailor Galaxia with it. Galaxia thanks Eternal Sailor Moon and disapears. The sponsor / teacher then runs in and thanks everyone. Sailor Mercury tells him that she will never forget his kindness. He then begins to laugh evilly and reveals himself to be Chaos!!! He slowly walks up the stairs and blasts everyone. He then enters the Galaxy Cauldron and closes the door. Just when all seems lost, Eternal Sailor Moon hears the voice of her friends who appear right before her! Seems they were revived after Galaxia was defeated! Sailor Galaxia, now completely healed tells them that it is now time for her to finish her fight for the future. All the Sailor Soldiers combine their powers and attack Chaos with a powerful attack which blasts him just as Sailor Galaxia opens the Cauldron's doors and stabs him with her sword. Chaos has been destroyed! Princess Kakyu and Tuxedo Mask then return and tell everyone that all the Star Seeds that were taken are now being reborn all over the Universe. Back on Earth, everyone celebrates and reflects on their victory and their love for each other. Each cast member then does a full curtain call with several performers saying a line of dialogue before their bow. As Eternal Sailor Moon and Tuxedo Mask bow, someone gives Eternal Sailor Moon a bouquet of red roses. She removes one, kisses it and gives it to Tuxedo Mask who throws it into the audience. Everyone bows.